Recently, when I was browsing through Pinterest, I was blown away with new plaid quilting designs. It gave me a great idea, and after discussing with fellow quilters, I realized how easy it is to work with this fabric and gain an overly worked looking quilt. So, does this mean – can we safely claim plaids or flannel as modern art of quilting? Perhaps, yes. In these times we are burdened with many responsibilities and let’s face it quilting is a time-consuming job. Joining small pieces to create a plaid-like pattern can end up project getting delayed, canceled or stowed high in storage boxes. That said, added below are a few pictures for inspiration. This picture is displaying a meticulously worked quilt; however, if you look closely, you’ll see that it’s a plaid fabric. The quilter has intelligently worked on the stitch to give it a look of a well-worked quilt. First and foremost, it renders a quality and heavily worked look of a quilt. Apart from that, it saves time. You can complete a quilt in 3 days or over the weekend. Henceforth, it has proved to be a great time-saver. Monetary-wise, it has shown to be a pocket-friendly option for quilters. Most importantly, it is strong enough to use for years. Not criticizing the traditional method of quilting here; but let’s face it – most of the times, stitches do open leaving quilt looking worn out. 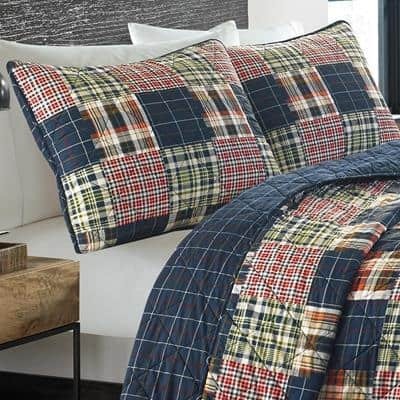 Plaid being one piece or chunks of large fragments of cloths hold the quilt stitches more efficiently and for a longer time. Off-late I’m ogling at the idea of using one base fabric and attaching elements to it. Instead of cutting and sewing the pieces together and getting lost in the process is not I am fonder of. The name says it all. Use two fabrics for each side to make it more user-friendly. I’m sure many of us donate our quilts to others or recycle it. However, if you’re a beginner let me give you a brilliant idea. Recycle your worn, torn quilt – How? Well, first repair your torn quilt by adding a patch(s). Use a plaid or flannel fabric or any fabric of your choice and sew the edges before moving in to create a stitch design with your quilting machine. This saves you from the hassle of layering. Moreover, it will also bar you from spending more money. Let’s be practical, quilting a whole new quilt takes a decent amount of time, and this is a great idea. You can also use two fabrics to create a reversible look. Perfect for winters. If your old quilt is dilapidated and recycling the full-fledged quilt is not possible; then cut the quilt’s damaged parts and save the good parts. You can cut in triangles, large squares or rectangle; or diamond or star shape and add to a new piece of fabric to create a table runner or a throw. Especially around winter, blankets are never enough for infants or freshly potty-trained toddlers. You can use plaid or cartoon print fabric to create a quilt, or if you have an old quilt, you can upgrade it by adding a new cartoon print fabric on top. We all have worn out denim, and fashion of wearing worn out denim has taken a grip by that, I feel. However, you can use old denim to create a strong and heavy quilt. You can play a lot with pieces of denim, if you are running short of denim, do not hesitate to ask from your friends and family to donate you their old jeans, I am sure everyone has old jeans. Pillow covers can be quite helpful alongside old bed linen. You can use them as quilting layers to produce either full-fledged quilt or a table runner or a quilted rug. Many quilters I know frequently use towels to create a thick layer for a quilt. It keeps it for sure makes for a warmer quilt then others. Trim the towel edges and if you have different sized towels then make sure you cut all the towels in the same size and stitch to create a long piece. You can also buy towels in backyard sales or from bulk sellers. They will prove to be quite handy. Specifically, if you intend to create a rug, then there’s no better form of the layer than a towel. Towel renders a thick immovable layer for the carpet. Just add an anti-skid layer to the bottom of your rug to make it a fluffy rug. With this, I come to an end of this blog; I’m sure I might have missed a few key ideas. If you remember any other idea not mentioned here, then do not forget to share in the comments below.